Madeline Usher has been buried alive. The doomed heroine comes to the fore in this eerie reimagining of Edgar Allan Poe's classic short story "The Fall of the House of Usher." Gothic, moody, and suspenseful from beginning to end, The Fall is literary horror for fans of Miss Peregrine's Home for Peculiar Children and Asylum. Madeline awakes in a coffin. She was put there by her own twin brother. How did it come to this? In short non-chronological chapters, Bethany Griffin masterfully spins a haunting and powerful tale of a tragic heroine and the curse on the Usher family. The house itself is alive around Madeline, and it will never let her escape, driving her to the madness just as it has all of her ancestors. But she won't let it have her brother Roderick. She'll do everything in her power to save him—and try to save herself—even if it means bringing the house down around them. The Fall has no doubt made it onto my list of favorite YA retellings. And it having been a retelling of an Edgar Allen Poe tale and having stayed within Poe’s style of writing was a major plus. Bethany has perfectly captured the essence of a Poe story: the creepiness, the mystery, the eerie setting, and the constant ominous feeling that something strange is about to happen. The backstory – all of the events that built up to the final scene of the book – was planned through and written beautifully. The amount of detail put into this novel was astounding; whether it was the setting, each characters’ feelings, or the event occurring during each scene. What I also love about this book is that straight answers towards what happened and why aren’t given; it’s almost like you have to figure some things out by yourself in order to understand what’s happening. And in some cases, such as the ending, you can almost create your own version of what happened. It wasn’t a common ending that we usually receive, (this happens, that happens, this is the outcome), we get to formulate our own absolute ending. The characters were unpredictable, which is a pleasant change from the usual. Yes, you are aware of what the characters are thinking, but the House is so unpredictable itself that the characters may not get to carry out their original plans. This kept a constant excitement factor of not knowing what was going to happen next. A subject is never sat on for too long. It may come back around, but it is only covered in a chapter or two before something else is introduced. The short chapters do exactly that; each covers a vital part of a scene or a scene in its entirety. With this, nothing was ever boring; no part was excessive, and it made for a great story. 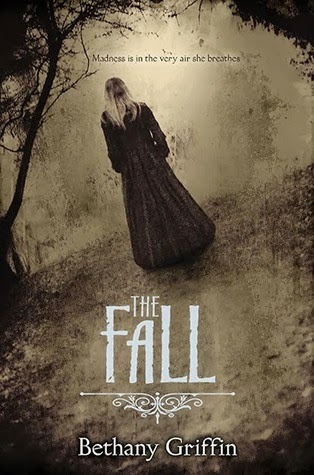 The Fall is a book that I recommend to all fans of Poe and anyone looking for an extraordinary YA retelling. I will definitely be rereading this one in the near future. Yes! I loved this book! I really liked that the ending was not spelled out and while I think I know what happened I can still choose to think what I like about it. I am completely creeped out by Poe after watching The Following, so this sounds more than a bit eerie to me.... perfect for this Halloween season. Thanks for the review! Awesome review! This sounds so good!!! Oh yay! I'm so happy to see good reviews for this one! I picked it up firstly for love of the cover. (It caught my eye and I just couldn't ignore it.) Secondly because it was Bethany Griffin and I have her Masque of the Red Death and Dance of the Red Death on my bookshelf TBR. And lastly, because it's Poe at the creepiest time of year! I'm still in a bit of a book hangover from Station Eleven even though I'm almost finished Horrorstör and need another chilling book. Station Eleven really left its mark and I highly recommend it! My fave of 2014 thus far. I just recently got this in. The idea of a Poe retelling is what drew me to it. I haven't had a chance to read it just yet, but I hope to get to it soon. So glad you enjoyed it! The ending left me feeling empty and longing for more as well as guessing if there would be a book two, which I am really hoping there will be. I wasn't ready for Madeline's tale to be over or the Usher curse to be broken.